Servania vs Concepcion Fight Results Pinoy Pride 21 full video replay highlights is brought to you by PinoyThinking boxing updates for the Filipino and by the Filipino. 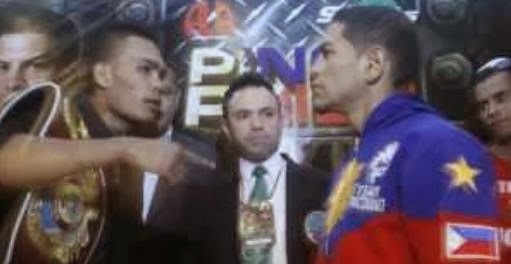 The Genesis Servania vs Rafael Concepcion on Pinoy Pride 22 with live fight updates, fight results and video replay highlights October 26, 2013. All action tonight for October 26 of Pinoy Pride 22 in the main event of ‘Pinoy Pride XXII:The Revenge’ on October 26 at the Pacific grand ballroom of Waterfront-Cebu City Hotel and Casino in Brgy. Lahug, Cebu city, Philippines. The undefeated Filipino Genesis "Azukal" Servania will battle against the Panamian Tormentor Rafael Concepcion. This is for the vacant WBO Inter-Continental super bantamweight title Championship featured on Pinoy Pride XXII of this Pinoy Pride series event by Ala Promotions partnered by Cobra Energy Drink along with ABS-CBN Philippines TV network. The video replay highlights and fight results of Servania vs Concepcion will be updated soon. FIGHT UPDATES: Congratulations to Genesis Servania for defeating Rafael Concepcion via 2nd round TKO and wins the vacant WBO Inter-Continental super bantamweight title. This is a sweet revenge for his fellow boxer AJ "Bazooka" Banal! Congrats Servania! All other Filipino supporting bouts also won! Its been a great night for Philippine boxing and its clear we have several promising fighters and future world champions. The Pinoy Pride Boxing headliner Genesis “Azukal” Servania battles Panamanian Rafael “El Torito” Concepcion for the vacant World Boxing Organization (WBO) Intercontinental super bantamweight crown tonight in the main event of Pinoy Pride XXII: The Revenge at the Waterfront Hotel in Cebu City. In the co-main event, undefeated Filipino fighter “King” Arthur Villanueva (23-0 slate with 13 knockouts) will fight Mexican Edgard “Chololo” Martinez (16-7 slate with 10 knockouts) for the WBO International super flyweight title. GENESIS Servania will headline Pinoy Pride 22 on Oct. 26 at the Waterfront Hotel and Casino along with fellow unbeaten boxer Arthur Villanueva. "We have finalized our agreement with ABS-CBN and our advertisers just last week for Pinoy Pride 22 in Waterfront Cebu on Oct. 26. It will be the first main event for Servania after his spectacular performance in Macau and after being featured in the latest issue of The Ring Magazine. We are looking at three fighters as possible opponents for Servania," ALA Promotions president Michael Aldeguer said in the interview. Genesis ‘Azukal’ Servania is now looking for KO victory if possible against former Panamian world champion Rafael ‘El Torito’ Concepcion who failed Servania's fellow countrymen AJ "Bazooka" Banal. The fight is for the main event of ‘Pinoy Pride XXII:The Revenge’ on October 26 at the Pacific grand ballroom of Waterfront-Cebu City Hotel and Casino. Servania said in the interview, "As much as possible I will try to finish the fight early because Concepcion is known to be a slow starter and he will try to get his momentum as fight goes to the later rounds." This would be the biggest challenge for Genesis Servania, his future decide this fight against Rafael Concepcion if he is a worthy elite fighter for the ALA Promotions. Concepcion wore a Team Pacquiao jacket with the country’s red, white and blue colors during the final press conference held today at the Waterfront Hotel. In the co-main event of ALA Promotions and ABS-CBN Sports, another undefeated ALA ring warrior in ‘King’ Arthur Villanueva (23-0, 13KOs) will defend his WBO Asia-Pacific super flyweight crown against Mexican Jose ‘Matador’ Cabrera (22-1, 10KOs). Who do you think will win this fight? Is it a rise for Servania? or a downfall to him? For Servania, this fight is also dedicated to the victims of recent earthquake happened in Bohol. Servania must win in this fight to Rafael Concepcion no matter what will happen. It's now or never for Genesis Servania. The video replay and fight results of Pinoy Pride XXII will be available soon. Also, the fight will be on live this Sunday, Cotober 27, 2013 starting 10:15 am. Till next for the update of this fight. Watch the video replay highlights of Servania vs Concepcion. I hope you enjoy the video replay highlights of Servania vs Concepcion. Sorry for the delayed. Incoming Search Items: Servania vs Concepcion live streaming abs-cbn, Servania vs Concepcion fight results, live streaming philippines October 26 2013, 2013 pinoy pride 22 XXII, full fight results list of boxers undercards of pinoy pride 22, full video replay pinoy pride Servania vs Concepcion Pinoy Pride XXII Worlds Collide, Servania vs Concepcion, Servania vs Concepcion live streaming, Servania vs Concepcionlive streaming latest updates and results of pinoy pride XXII 22, who wins the Pinoy Pride 22 Servania vs Concepcion fight? Servania vs Concepcion fight winner? Early fight results and complete results of Pinoy Pride 22 Servania vs Concepcion twitter and facebook results' update blog round by round 2013.